Shoutout to all the grocery stores that offer free samples – I’ll try anything they offer me. Granola? Mmm crunchy! Sausage? Hey, why not. Pie? Not even a question. Wine? Bless you Trader Joe’s!! It wasn’t until I tried something so simple, so flavor-winning, that I realized my grocery sampling could lead to bigger and better things. 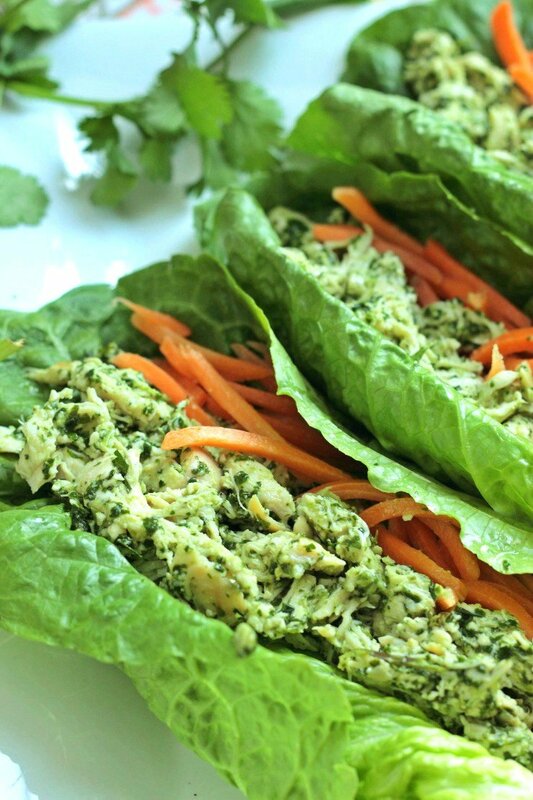 And the inspiration for these cilantro pesto chicken wraps. Maybe I’ve been living under a rock, or maybe this is as new to me as it is to you, but one fine Costco-sampling day I tried cilantro pesto on a piece of naan bread that pretty much blew my mind. Where has this been all my life? Who has been hiding this from me? Can I dive head first into this goodness and eat my way out? So of course I buy the pack of 86 containers (ok maybe it was just three). Months later, after all my prepackaged pesto was consumed, I had an itch for that fresh pesto once again. So I created a killer lunch using a leftover chicken breast and a homemade version of the cilantro best-o…I mean pesto. The fresh bite of cilantro, combined with an olive oil and lime base, mixed with the robust flavors of pine nuts smothered all over shredded chicken, all nestled into a few crunchy romaine lettuce leaves pretty much sums up lunchtime heaven, does it not? Feel free to add whatever other ‘fillers’ you like. I chose matchstick carrots for an extra crunch. You could add sautéed sweet peppers, red onions, diced tomatoes, or nothing additional at all. Just don’t forget the pesto! Additional add-ins: matchstick carrots, broccoli slaw, sweet peppers, red onions, diced tomatoes, etc. Looks so delicious.yummy!! Simple to make too. I love free samples too…no shame either..haha! No shame in our game sister! And simple is totally my jam! I can’t believe your name is Chrissa! So is mine with 1 S! I’ve never seen anyone else with that name! This recipe looks so amazing I can’t wait to try it! OH MY GOSH!!!! Twinsies!!!! I met a Krissa once, but never a spelling as close as yours is to mine! Cheer Chrisa! I am a sucker for any chicken-y salad type dish! Haha! And yea, romaine is SO good!!! Live long crunchy lettuce!! Currently I have about 4 head of Romaine and 2 Bunches of turnip greens in my fridge….lettuce wraps should happen! Dang girl! You are always stocked and loaded with fresh produce. I totally dig romaine too – I need that crunch in my life! Oooo, oo! Would it still be delicious with what I think is a slightly less expensive nut choice, walnuts? I’ve been putting off pesto for a while but this does look lovely! So yum! Pinning again as usual! You got talent girl! I’m not a cilantro fan, but cilantro aside, this recipe sounds fab! You could absolutely do this with a traditional basil pesto too! Thanks Rachel! I love discovering new food products through Costco sampling! 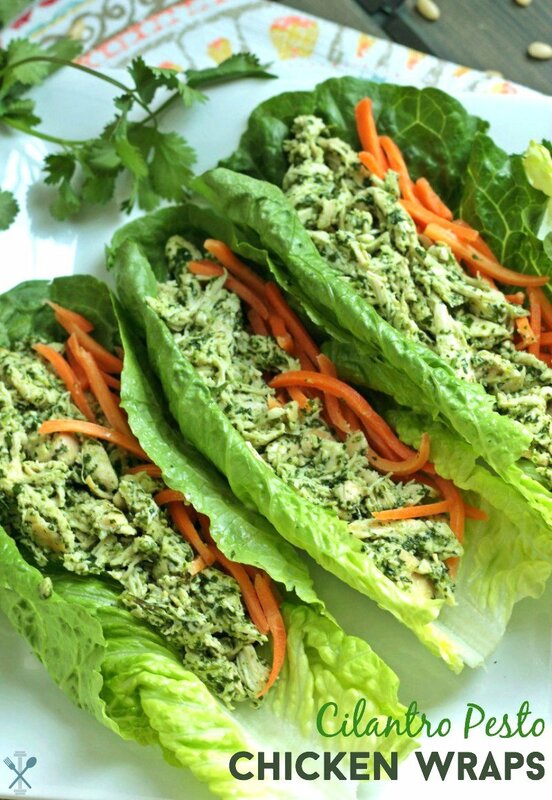 These lettuce chicken wraps look amazing. 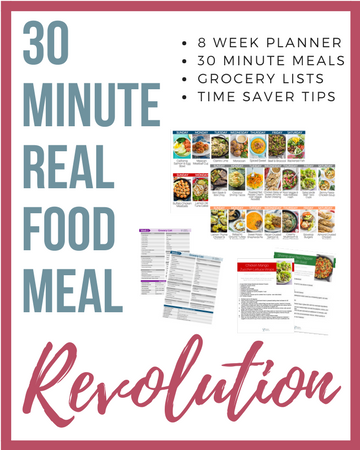 Love that it’s Paleo and Whole30 compliant! Isn’t it the best? There have been so many products I’d never buy based on the package but after sampling it, I’m always sold. I’m glad you are digging this recipe Marlynn! Thanks! What a lovely combination of ingredients for a springtime meal! Can’t wait to try this! Thanks Kelly! It’s definitely a fresh lunch that’s perfect for spring! Oh my – that looks delicious!! 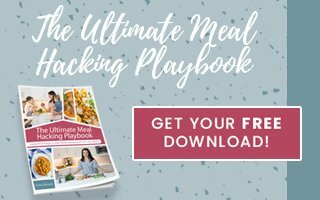 Love finding new recipes to try out! Thanks for sharing..
Of course! Thank you for stopping by Alexis! Adding this to my brunch ideas for ladies day. They are going to love this recipe. Don’t feel bad about free food. How do you think we have lunch when we are there. Oh I love this idea for brunch! Perfect finger food for a get together. And thanks for making me feel better about chowing down on all those freebies Candy! Awesome to hear Cole. Thanks for the pin love! 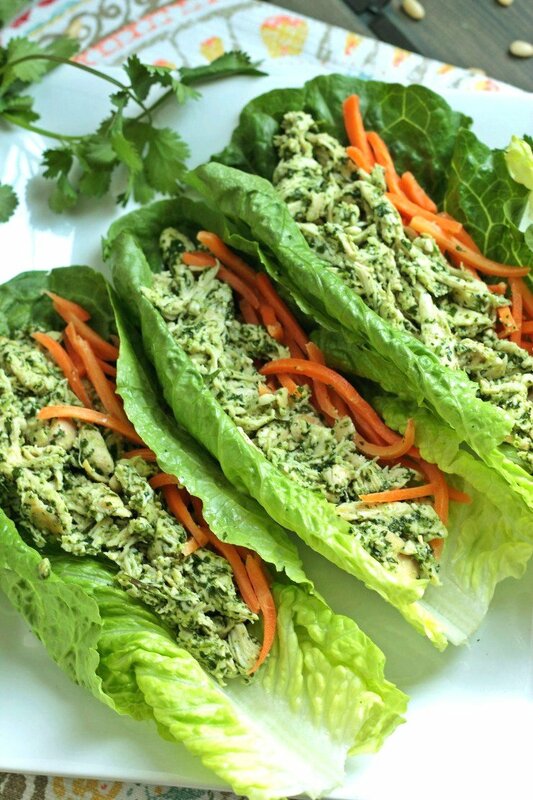 Lettuce wraps are the perfect low carb yet yummy lunch option! SO true! I come up with all kinds of crazy combos to stuff in those romaine leaves. Glad you agree Kari. Thanks for the pin love Jessica! I hope you totes love this lunch! These sound great! I love anything with pesto! Pesto = life (along with wine, chocolate, and cable television). Thanks Leah! Oh Denay! You just made my day. Thanks so much you sweet friend! I will take inspiration for new recipes any way I can 😉 Thank you for stopping by and always supporting me! A little giggle is good for the soul! So glad this recipe sparks your interest Liz! Enjoy my friend. Delicious! I love pesto so I’ll need to be giving this recipe a try. Good idea Cassandra! Pesto rocks my world so I could eat it on toilet paper, seriously! Me too! Although I don’t buy them often since they can be so spend! But great for pesto or toasted to sprinkle on salads! Enjoy Clare. I need to make those today! They look wonderful! Good idea! I hope these become a lunchtime staple for you! Oh, two things I love pesto + chicken in one. I’ll have to give this a try! Pesto is always a win. ALWAYS. I hope you love it Tiara! 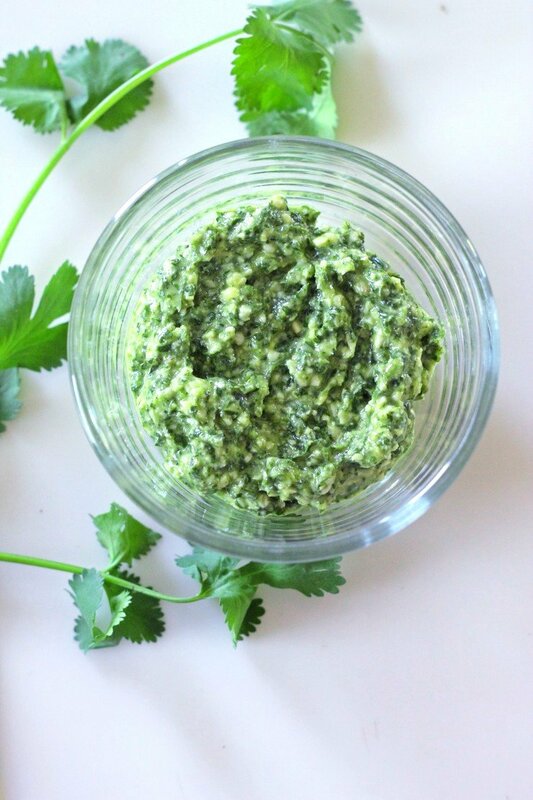 I’ve never tried the packaged cilantro pesto but know already that I would prefer your homemade version. This is the perfect low-carb lunch! ME EITHER! Hence why I had to buy a stockpile of it at Costco! But I agree, homemade versions are always better! Thanks Joanie. These look so good! I love eating lettuce wraps for lunch! Thanks Cara! Lettuce wraps are always my go-to for easy, quick lunches! Oh my gosh YUM!! Pinning this FOR SURE! Your pictures are beautiful! This looks and sounds delicious, I’m definitely going to try it! Just pinned it! Thank you so much Lezley! And thanks for the pin love. Enjoy! Hahaha this is too funny because I am the same way. I LIVE for free samples at the grocery store. These look absolutely delicious, cilantro is one of my favorite herbs! They are the best!! Even if it’s normally stuff I don’t eat, I’ll never turn a sample down (it’s a real addiction). I love cilantro too! It always adds a nice fresh kick. this is why I LOVE costco so much! You can practically have a free meal just by sampling all of the food haha. Summer is my favorite time of year for seasonal eating. I love serving plant-based dishes and this is a great one. We love salad wraps at home. It’s our go-to! I love summer eats! Fresh fruit & veggies, and GRILLING time! Glad this recipe found you Nicole! These sound delicious! I love pesto. You are too cute! I have those days EVERYDAY! And pesto anythings wins me over. I’ll have to try these!! I know, sampling ninja over here!! Hehehehe. Thanks friend! This pesto sounds seriously delish! I can’t wait to try it, such a fun change from traditional pesto! Sometimes it’s fun to change things up a bit, although I love me some traditional basil pesto too! Thanks Sam! Omg these look so yummy!!! I just love pesto! So need to give these a try! Yum! I hope you do! Pesto is pretty much bomb on anything. Enjoy! Oh I’m so honored! Thank you so much Lisa. Love the Welcome Home Wednesday Link Party!